Are you ready to explore 28 star systems, trying to prevent a cataclysmic galactic war? Are you the stuff of heroes? You'll find out when you play MegaTraveller 1: The Zhondani Conspiracy, part 1 of an epic space adventure. Those familiar with role-playing board games will recognize this as the computerized version of the popular award-winning Traveller game. Designer Marc Miller has broken new ground with this board-to-computer translation, adding many arcadelike features to MegaTraveller. Still, the game moves slower than a tax refund when it comes to character development and routine tasks. 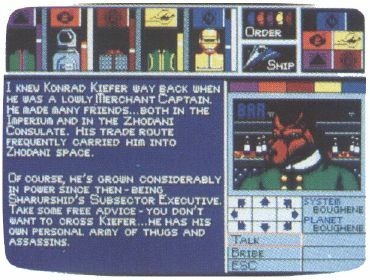 Amazingly detailed EGA graphics enhance your party's exploration of the richly diverse planets, each defined by numerous distinguishing characteristics. For instance, you might discover a huge water world with a poisonous atmosphere and a small population with a prestellar technology—but no starport where you might land. This degree of detail is evident throughout the game, from weapons variety to vehicle types to the colorful characters you're likely to meet during your travels. You get a 144-page manual crammed with background story, charts, diagrams, and explanations of every aspect of gameplay. MegaTraveller allows you to create extremely complex playing characters to include in your party of five. Characters can develop up to 54 vital skills, which determine how successfully they will perform tasks required during the game. It's advisable to make each party member a specialist in several unique areas rather than to develop a group of, say, fighters. During the game, characters can pay for training and education to add new skills or enhance existing abilities. Your ship, the Interloper, must be greatly upgraded during the game to give it the capabilities needed for success. The money for all this training and upgrading comes from trading. Saving the galaxy costs money, and an elaborate bartering system will let you earn credits through interplanetary trading. MegaTraveller supports RealSound as well as digitized sounds by Covox, but you'll need 600K of free RAM to hear all the sounds. With less memory, you'll hear only partial sound effects. But even without a sound card, you'll have great sound effects. With all the obvious work that went into this game, I'd love to say I recommend it for everyone, but this game isn't for everyone. It requires a lot of methodical work, such as training characters, earning money for required supplies, and exploring vast regions. You'll need to set aside a fair chunk of time to really explore what MegaTraveller has to offer. Maybe if I were stranded on Gilligan's Island and the Professor built a 386-based PC using coconut shells, bamboo sticks, and the never-say-die batteries from the radio for power….